I would have never imagined the fact that classy and sporty could work so well together! I had always thought that both of these styles should never be mixed and that wearing them together in one outfit could be a big mistake! But as I do like to experiment with my style and as I have been seeing this combination quite a lot lately ( starting from fashion blogs, lookbook.nu etc. to street style), I did decided to play with different outfit elements and try to make my point of view on this mix of two styles! I received this black & white plaid coat from Lovelywholesale approximately a week and a half ago, but I have managed to wear it at least five times (!) already! I do love the coat and I have received tremendously great feedback from others about it as well, which I think just proves how great it is! The blouse I am wearing in this look is also from Lovelywholesale, whereas the necklace is from Dresslink. The classy side of this outfit is the coat, the blouse and the necklace, whereas the sporty side are the sneakers and the bag – both from H&M! The sneakers are still available and I strongly recommend them ( very comfortable & qualitative), but I think that the bag is gone as I bought in the start of the summer on sale! Nekad nebiju iedomājusies, ka sportiskais stils tik labi ies kopā ar klasisko stilu! Vienmēr biju domājusi, ka šie abi stili ir diametrāli pretēji un, ka kopā tos sasaistīt būtu diezgan liela kļūda. Bet tā kā man vienmēr patīk eksperimentēt ar savu stilu un tā kā dažādās interneta vietnēs ( blogos, modes ziņu portālos, lookbook,nu), kā arī uz ielām aizvien vairāk un vairāk pamanīju to cik šī kombinācija kļūst populāra, es arī nolēmu nedaudz “paspēlēties”! Mugurā uzvilktais melnbaltais mētelītis neilgā laika posmā ir kļuvis ļoti mīļš un to no Interneta veikala Lovelywholesale saņēmu vien pusotru nedēļu atpakaļ! Šajā laika posmā mēteli esmu uzvilkusi jau reizes piecas ( vismaz!) un saņēmusi patiešām daudz atzinīgus komentārus un komplimentus! Blūzīte arī ir no šī paša interneta veikala, savukārt, kaklarotu un auskarus saņēmu sadarbībā ar Dresslink. Klasiskais manā tērpā ir šis mētelis, blūzīte un kaklarotiņa, savukārt sportiskais ir šīs melnbaltās sporta kurpes, kā arī šī lielā masīvā soma – abi divi no H&M! Kurpes vēl ir pieejamas ( un tās noteikti rekomendēju, jo tās ir ĻOTI ērtas kā arī kvalitatīvas), savukārt soma vairāk nav pieejama – to pirku vasaras sākumā uz atlaidēm! Patīk mētelis, botas… viss patīk! <3 Manai acij tīkamas bildes. Šīs botas piesaistīja manu uzmanību veikalā, patīk, ka viņas ir tādas savādākas! You look so pretty ! I really like your coat. Thank you! At first I was a bit hesitant to add the sneakers to this look, but then I thought that I should just go for it & see how it looks! I am glad you think that they are a good match with this outfit! 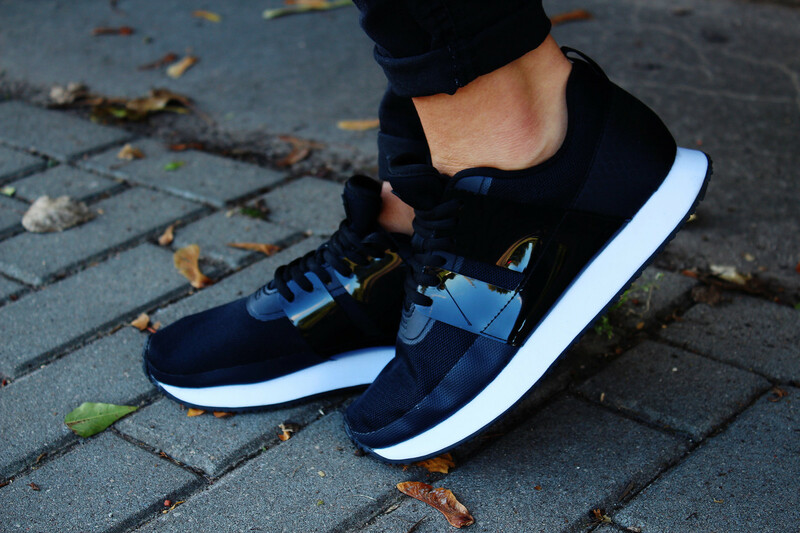 Your chic sporty look is so cute! 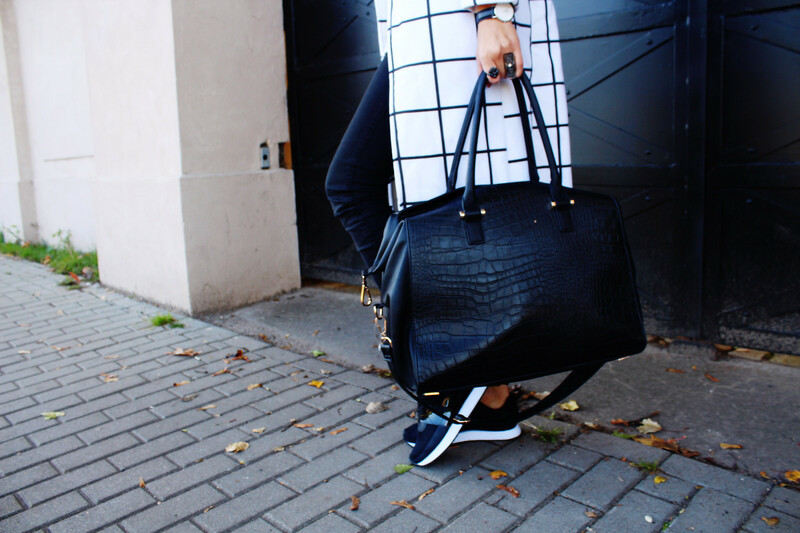 Love how you mixed sporty and classy! I am so happy you like this combo as I wasn't sure at first whether it would turn out the way I'd like it to turn out! I appreciate your comment! Thank you Kat, I always love reading your thoughts on my outfits! Aww that is such a sweet compliment! Thank you very much! You have mixed classy and sport very well Maddie. Love that necklace. I do love this classy and sporty mixed outfit! That coat is a stunning piece and one that I would wear all the time! That blouse is really a fabulous piece too! Oh, that is a truly big compliment because, honestly, sportswear is VERY out of comfort zone, therefore, I am very happy to hear that I look natural in this style! This coat is beautiful! Loving the pretty print! Love your coat! 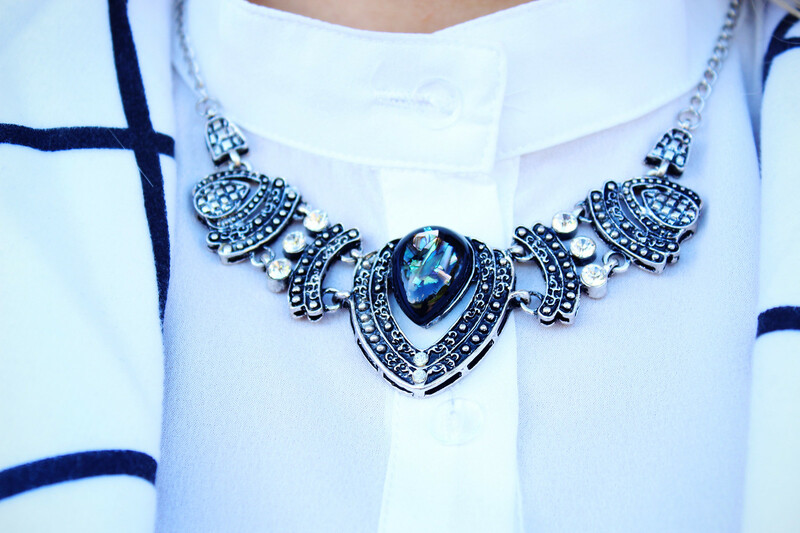 It's so so chic! Isn't amazing Maddie how well sneakers go with more polished looks. Who would have thought so. A few years ago you would have made my head hurt trying to convince me of this! Spot on! I would have never imagined that! Thank you very much for so, so many kind words – you made me blush!! Love your coat and bag! You look so chic and polished. Your photos are stunning.